All children and young people (aged 5 – 18) should experience regular high quality Physical Education (PE). The medical evidence is too strong to not have PE as a compulsory subject in the curriculum. At St Monicas, we provide the broad and balanced programme of physical education your child is entitled to; with activities designed to be enjoyable, vigorous, purposeful and regular. Through providing positive experiences, a lifelong interest in physical activity is encouraged. The range of physical activities is wide and includes athletics, dance, games, gymnastics, swimming and outdoor education. A high quality programme is designed to satisfy the needs, abilities and interests of all individual children. There will be some children who prefer individual activities to competitive team games and others who enjoy aesthetic movement. Opportunities also exist in PE for pupils to gradually be given more responsibility to plan, lead and organise events and develop the right attitude to competition – to be positive in defeat and gracious in victory. PE can help your child to develop positive attitudes which lead to success. Please click here to view photos from recent sporting events and activities. PE at St. Monica’s Catholic Primary School is a very important part of our curriculum. It is taught for at least two hours per week in KS1 and KS2 . In the Early Years, we encourage physical activity and a love of the outdoors through having free-flow to the outdoor area every day. 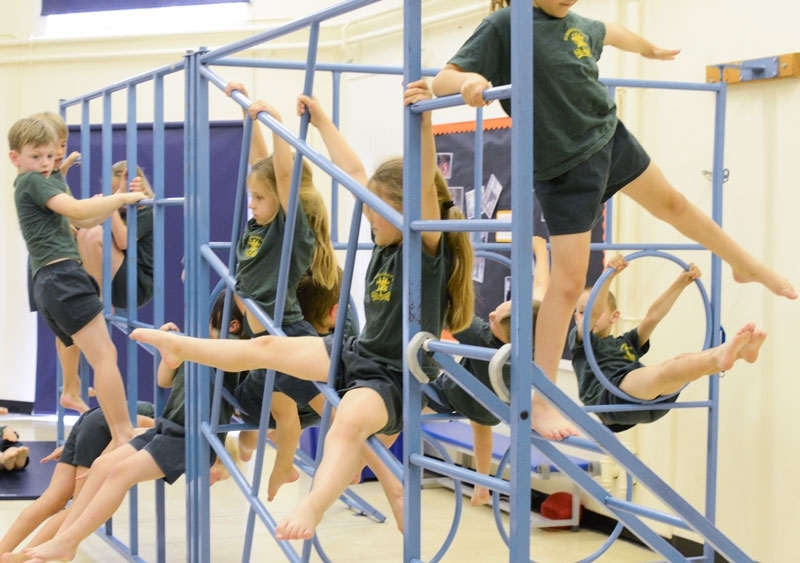 Our indoor facilities consist of a hall with fixed climbing equipment and a range of portable gymnastics apparatus. Outside, we have two large playgrounds with painted lines and climbing apparatus, an outside area for Reception class which includes climbing apparatus and space for scooters/cycling; we also have a new Astroturf football pitch. We are proud and delighted that St. Monica’s was the first primary school in London to be awarded the Gold Kitemark in sport this year. This is the second year we have achieved this award and this is down to the children, parents and staff at our school. It is essential children are prepared for PE sessions. The PE kit is green shorts and T- shirt with the option of green track suit bottoms for outside games. Children have bare feet for gymnastics and dance for safety reasons and high quality movement. Children need plimsolls to move from the classroom to the hall. We encourage all children to wear trainers for outdoor PE as we feel they are more secure than plimsolls. No jewellery is allowed for PE. Children need to remove earrings at home on the days they have PE. Your child’s teacher will be happy to discuss in confidence any problem arising from this request. Sports Days are always great days out at St. Monica’s school. It takes place over two mornings, one for KS1 and the other for KS2. The children have the opportunity to compete in house teams and age groups. It is both fun and competitive. Each child takes part in at least 6 different races from the egg and spoon race to a cross country race. These are great days out where all the family are involved. The children especially like seeing their parents running in their highly competitive race! This is an important part of the PE Curriculum and pupils in Year 5 travel to Southgate Swimming Pool for 15 weeks of lessons during the course of the year. They are taught by qualified swim instructors who work for the London Borough of Enfield. At the end of June, our children take part in a competitive gala against other schools. The children are also taught water safety. In order to ensure our children are involved in structured play at lunchtimes, we have trained play leaders from Year 6 who arrange a variety of sporting activities. Some of the sports they cover include rounders, football, multi skills games, skipping and basketball. We are also in the process of purchasing more sports equipment for children to use at playtimes. Our year 5 and 6 year groups enjoy 12 weeks of tennis coaching at our local tennis club. They are taught by a qualified instructor. In the final week, the instructor gives free after-school coaching lessons to any child who has shown talent or a keen interest in tennis. All children are encouraged to join the after school tennis club and summer camps. Your child can experience many benefits, both physically and mentally, as a direct result of their participation in some form of physical education – and a higher level of participation can often lead to greater rewards. Parents can do much to help their child gain the greatest benefit from physical education by taking an interest, offering encouragement, and if possible joining in. We offer a range of activites out of school. These include lunchtime games and after school sessions. Throughout the year we offer extra classes in sports such as athletics, cross country, gaelic football, netball, dance and football. Our school has both girls’ and boys’ football teams, netball, cross country, athletics and tag rugby and they compete in leagues and fixtures against other schools in Enfield. Our league games usually take place at Southgate Secondary school and other ‘friendly’ games take place on our school site or at other local primary schools. For sports clubs that have family and/or specific youth activities in the area please look up http:/enfield maps.google.com/ and type in sporting clubs in your area. If you have an affiliation with any other clubs that may be of interest to families and children at St. Monica’s please contact Karen Borley through the office.